Darryl Cherney has written scores of songs about the actions he and his friends have taken defending the environment, fighting for civil rights, and protesting and mocking the political status quo. He has lived among the redwoods of Humboldt County, California for over eighteen years with solar panels, a wood burning stove, and up a dirt road miles from the nearest power line. He honors both Goddess and God, and likes it here on planet Earth. 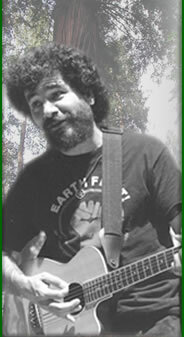 Alongside Greg King, he co-founded the campaign which resulted in the establishment of the Headwaters Forest Reserve near Eureka, California. He has worked with Earth First! at successfully protecting other areas, as well, including portions of the Cahto Wilderness, Trout Creek (both in Mendocino County, CA), Luna (where Julia Butterfly sat for two years in Humboldt County, CA), and even some individual trees (in California and Ohio). And he worked alongside his political organizing partner Judi Bari at building alliances between loggers, steelworkers and environmentalists. All the while writing and singing songs about it. While touring universities and organizing for a large, prototypical campaign called Redwood Summer, Judi Bari and Darryl Cherney were car bombed in Oakland, California. (www.judibari.org). The FBI and Oakland Police blamed the two (falsely) for bombing themselves and had them arrested. Judi was almost killed while Darryl was only slightly injured. Redwood Summer carried on regardless and serves to this day as a model for political campaigns nationwide. Judi and Darryl went on to sue the FBI and Oakland Police agents for violations of the United States Constitution. Tragically, Judi died from cancer in 1997. Darryl along with Judi's estate and their team of veteran civil rights attorneys took the FBI and OPD to trial in the Spring of 2002. A jury unanimously awarded $4.4 million for violations of Judi and Darryl's freedom of speech and their right to be free from unlawful arrest and illegal search and seizure.